Bubble your toes' cares away with ArtNaturals Sit Back Foot Spa. Our elegantly designed mini-spa for fatigued feet and tired toes is just what the podiatrist ordered. Are you on your feet all day? Are you a runner/walker/athlete? Or just want to pamper a part of yourself that often gets neglected? The Sit Back Foot Spa allows you to enjoy a miniature whirlpool of bubbling bliss right in your own bathroom. 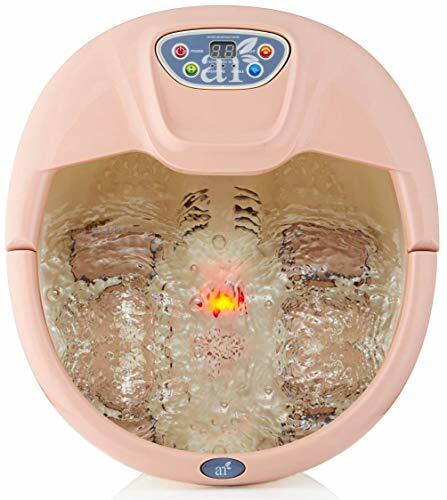 ArtNaturals Sit Back Foot Spa is an elegantly designed mini-whirlpool that relaxes and relieves achy, tired feet. Ideal for those on their feet all day, as well as runners/athletes. Nodes and rollers massage out knots and sore spots. Can be used with essential oils or foot salts. Built-in temperature controls and digital display for easy use. If you have any questions about this product by ArtNaturals, contact us by completing and submitting the form below. If you are looking for a specif part number, please include it with your message.